Our Company Specializes In Social Media Marketing. Our Services Include Providing Youtube Marketing, Facebook Marketing, And Twitter Marketing. Expose Your Page To The Right Target. We Give Guaranteed USA Fans And We Bring Satisfaction To Our Clients. 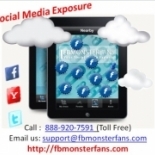 Fbmonsterfans.com in Los Angeles is a company that specializes in Computer Related Services, Nec. Our records show it was established in California.